FauxS-XP (Cobalt) FINAL UPDATE - Before I retire the FauxS-XP Icons line I wanted to do one last Update. This is a completely rebuilt package containing all of the Icons displayed in the Thumbnail. All Icons are rendered in 16x16, 24x24, 32x32, 48x48, 64x64 & 72x72 Windows XP format, as well as 16x16, 32x32, and 48x48 Windows 9X format. A Updated Bonus Pack will be posted shortly. Stop by www.fauxs-x.com for more cool FauxS-X Stuff. Comments or Suggestions Please! Makes me wish I had Windows XP! Way to go, Paul ! I've waited ages to see You back with Your incredible work ! No need to convert Mac-icons anymore ! I would be willing to give permeision to someone if they wanted to convert them down to 9* compatable, if anyone wants to do the work. I like the icons you made. One small side note : The logoff and sleep mode icons seem to be missing ? Your right, I shall correct ASAP. AWESOME! I should have known the reason I couldn't get even near Wincustomize is because mormegil has post an icon pack! SORRY for my mitake with the .ip,i remenber that's is the iconpackager extension. 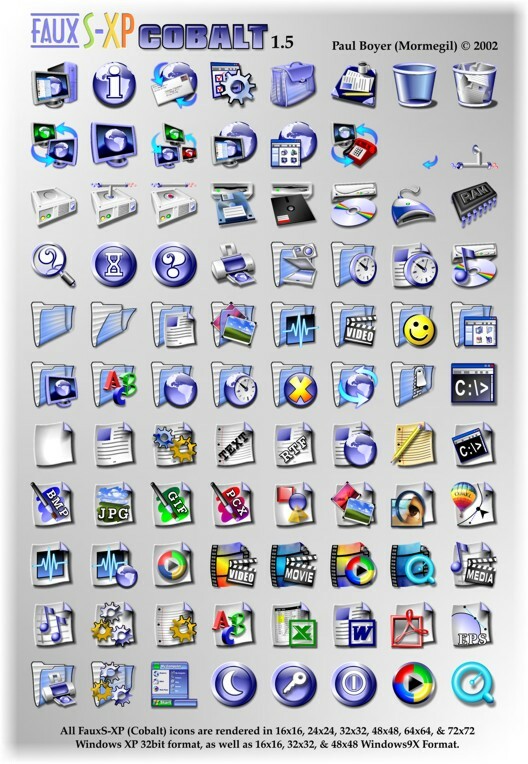 These are wonderful,I was hoping you would release some icons for XP. Bother! XP insists on using it's own icons for my DVD and CD-RW drives... I've scanned properties of both looking for a way to select a custom icon; does anyone know how to use mormegil's CD icons? These icons look fabulous under XP; I've even deleted my old FauxS icon packs ;*( Sad... But these new ones are so much better! If you figure it out let me know I would like to know. very nice, i can't wait to see your future developments. I don't even know what to say. These are.. these are... just incredible. I mean, holy cow. I have used Corel Draw for a decade now and I have no idea how you were able to create these using it. I am in awe. Well it's not like you need anymore praise, but WOW! You need to set up a donation page with PayPal - I'd give you a donation to help see this entire package get finished. Excellent work.